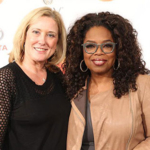 How On Earth Did I Meet Oprah? First, we must go back in time to understand the “why” behind writing God Gave Us Wings. After almost losing my commercial real estate firm as a result of the recession, I became consumed with making money. I lost all emotions—no tears, no laughter, and especially no joy…just emptiness. Then, one day, in desperation, I cried out to God to give me back my joy. The answer I received was unexpected; the message became crystal clear to me, to step out in faith and use my life experiences to show others how to do the same. Next, this set in motion how I would identify the women included in the book. During the entire two-year process of writing this book, I prayed every day before writing. This included asking for divine guidance in identifying types of stories that required the greatest faith. Oprah Winfrey was the first person whose name immediately came to mind during prayer, and she was by far the one who took the most faith. Shortly afterward prayer, I learned that Oprah was scheduled to come to my hometown for the Life You Want Weekend. This was my big chance for us to meet. But how? The VIP tickets were sold out. Who could help? There were only five days left before the event, and it would take a miracle. Just a few days remained before the event when a message popped up in my email, saying, “You’ve got mail from OWN Magazine.” They were having a drawing for tickets to the show—and guess what? I won! Not only did I win tickets, but someone else managed to get me a meeting with Oprah! It was the big day—October 20, 2014, at 11:30 a.m. I began nervously pacing back and forth, almost panicking at the thought of meeting the Queen of Queens. Thank God for a group of friends who immediately took action and began praying over me. It’s a little difficult to explain, but immediately, a sense of calm came over me. Next, I remember being escorted to a large room where Oprah’s other invited guests waited to meet her (100 of them or less). As you can imagine, security was extremely tight, and you could not take any personal items in the room. All guests were instructed to form a single line and, one by one, took turns meeting Oprah. I was about number 20 in the line, and it went fairly quickly…until I stepped forward to meet this woman and, in that moment, time stood still. Unbelievably, I wrapped both my arms around Oprah and, as you can imagine, this immediately got Security’s attention. Oprah quickly soothed their concerns with a quick head nod, while she hugged me in return. Just think, if I had listened to my fears, I would not be writing this blog about how I met Oprah right now! Instead, because I acted in faith, today, I am a published author of a bestseller, which, in less than 24 hours, hit Amazon’s #1 Best Sellers list for new releases. Now, it’s your time to fly! How do Dads raise the bar for their children to strive in a complex world? Copyright © Connie Rankin. All Rights Reserved.